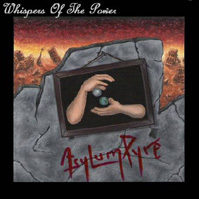 Asylum Pyre is a young Power/Progressive Metal band from Paris, delivering their debut demo “Whispers of the Power”. Besides the Power and Progressive elements, I would definitely add Symphonic to the mix. The demo consists of seven titles, but only three real songs, because there are two interludes, an intro and an outro. But no worries, because the highlight of the demo is the ambitious 11 minute track “Different Sides, Same Thoughts”, making this demo clock in at over 25 minutes. The band makes heavy use of the keyboard, but there is also a heavy role for the guitar. The music is quite bombastic as is to be expected, switching from slow acoustic breaks to fast Power Metal parts. But it is difficult to fully appreciate the songs because of the production (which I will elaborate on later). It mainly effects the drumming, which sounds quite muffled. The vocal duties are shared by female operatic singer Elodie and Johann who delivers both clean baritone and growled vocals. Both are capable vocalists, but they also suffer from the production a bit, making them come across quite fragile next to the instrumentation. The production is okay for a self-financed demo I guess, but there is a lot of room for improvement. This type of symphonic music relies heavily on the atmosphere that is created and a lacking production is a real pain, because it makes it difficult to appreciate the compositions. This band has some ambitious ideas and I think they are capable of coming a long way, but I hope they will find the means to make a professional production in the future. They have written some good songs, so I am eager to hear how they progress from here.